This is Florida Keys living at its finest. 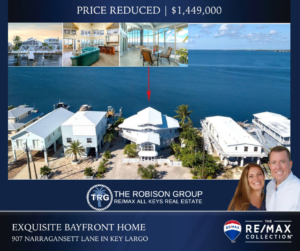 Spectacular direct bay front home located at 907 Narragansett Lane Key Largo that offers amazing 200 degree views of the Florida Bay with water views from every room. This is the home that you’ve been searching for! The unique architecturally designed custom built home was built and inspired by hurricane expert, Sidney Woolgar, to withstand 250 mph winds and a category 5 hurricane. The interior was fabulously renovated in 2016 and includes 23 ft cathedral ceilings with recessed lighting. The main living area features soaring windows to enjoy the open waterfront views. The home also offers beautiful porcelain tile floors plus a gorgeous kitchen with custom cabinets and the finest Italian granite countertops. Additionally, the marble bathrooms also offer custom cabinets and the finest Italian granite countertops. Other amazing features include a Florida room, elevator, dumbwaiter, upstairs loft and an exquisite wrap around balcony. The double waterfront lot was raised 3 ft to prevent flooding. Futhermore, the property offers an 80 ft reinforced concrete seawall, a 34 ft t-dock with 12,500 lb boat lift, dockage for 3 boats and ocean access within minutes via Adam’s Cut. This home is a hurricane Fortress. Even the roof is supported by custom made 16 inch beams anchored to concrete pillions every 10 ft that are attached to coral rock 20 ft below ground level. 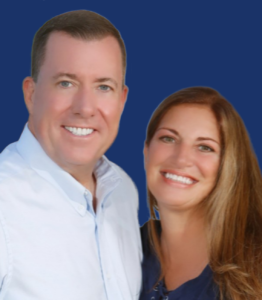 You can also contact Aryl and Pati Robison, The Robison Group, at 305-781-7506 or TRGTheKeys@gmail.com for more information or to schedule a private showing. We are here to assist you in anyway possible and look forward to hearing from you.